Looking to capture a bigger pie of Indian ecommerce that extends beyond retail, Snapdeal has now integrated APIs of Zomato, Redbus and Cleartrip respectively. 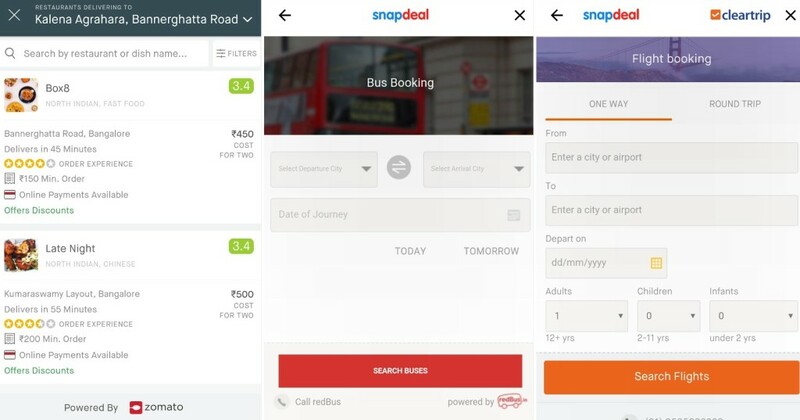 With this integration, a user can now book bus tickets, order food and make travel arrangements, other than shopping on Snapdeal’s etail platform, all on the same app. The arrangement will be a win win for both Snapdeal and the other channel partners as while the latter will get access to Snapdeal’s huge user base, Snapdeal will earn a commission on every transaction made on its app. This will also contribute towards boosting the GMV ( Gross Merchandise Value) on Snapdeal through airline transactions booked on Cleartrip. Snapdeal had recently also brought real estate and financial services under its fold foray with the same lookout. After this move, Snapdeal will look to compete directly with Paytm who has long evolved from a payment gateway to now being a full-fledged app on which users can only make and receive payments, but also shop, recharge their phones, and book bus tickets. Paytm has a similar API arrangement with Travelyaari for booking bus tickets on the Paytm app. Snapdeal also competes with Paytm with its Freecharge wallet. In a recent interview, Paytm founder and CEO, Vijay Shekhar Sharma had talked about how he sees Paytm emerging as a “Super App” which will be an all-in-one app. Interestingly both Snapdeal and Paytm are funded by Chinese ecommerce giant, Alibaba. Superapps are common in China, and it will be interesting to see if Alibaba will try to bring its country’s best practices to its investments in India.